Have you found your soulmate? What's on your lover's mind? Are you on the right path in your career? Call Yulia Applewood and uncover the truth! As a natural born medium, Yulia Applewood has communicated with the spirit world throughout her lifetime. She is able to help those who have lost loved ones connect with spirit, by providing her clients with specific messages and validating information. Yulia is also able to provide individuals, children and couples with a clear glimpse into their futures, using her innate psychic abilities and variety of divinatory tools. Yulia uses her gifts of energetic healing, folk magic and common wisdom to bring hope, healing and empowerment to her clients in a compassionate and empathetic way. Each reading and remedy is confidential and uniquely tailored to the client's needs. 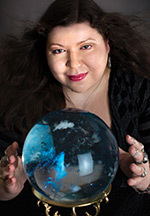 Yulia uses many different divination styles including Tarot, Mediumship, Palmistry, Clairvoyance, Crystal Ball, Rune, Bone Casting, Crystal and Past Life Readings. In addition, she holds an advanced degree in neuroscience and behavior. Yulia Applewood is available ... and ready to take your call!